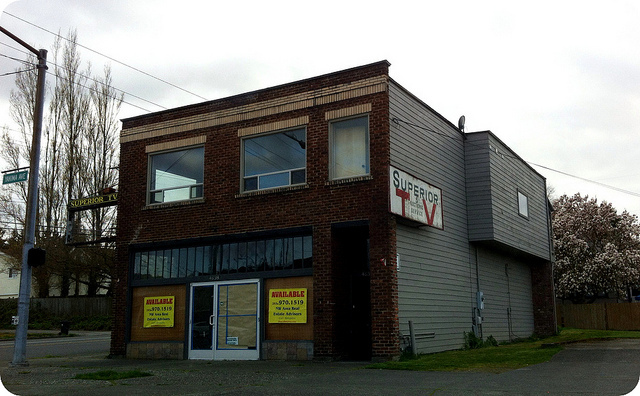 The vacant building at 4638 South Yakima had most recently been Superior TV with a living unit upstairs, but its been vacant for a while. A 1977 photo of the property shows it occupied by Superior TV, so they had a pretty long time in the space, most likely repairing the tube TVs that use to be popular. The building was originally built as Goodwin Drug Store in 1923 and Wm. Seese was the builder. This entry was posted in Tacoma, Their future is in question, WA State - Pierce County and tagged drug store, Goodwin, Superior TV, vacant on April 8, 2013 by admin.